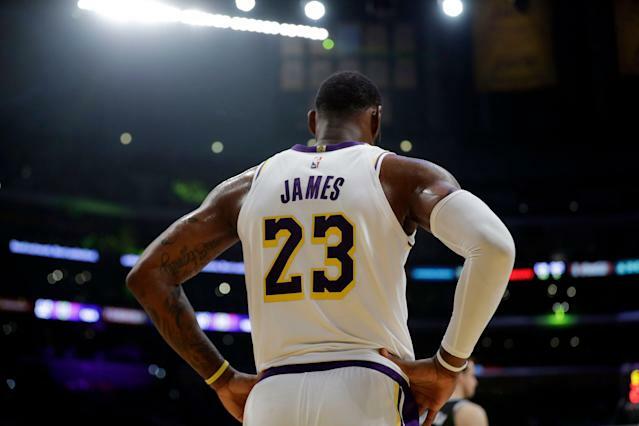 The Los Angeles Lakers are eliminated from the NBA playoffs, but that didn’t stop LeBron James from playing hard on Sunday night. In a 111-106 win over the Sacramento Kings, James notched the 81st triple-double of his career with 29 points, 11 rebounds and 11 assists in 35 minutes of action. James’ big night helped the Lakers snap a five-game losing streak. James’ first season in Los Angeles hasn’t gone as he hoped, but he said after Sunday night’s win that he is not going to “cheat the game.” When he’s out there, he’s going to play to win. With the win, the Lakers improved to 32-41 on the year. James is going to miss the NBA playoffs for the first time in 14 years. Throughout several spells of losing, James’ effort, especially on the defensive end, has been questioned as the season has progressed. Following Sunday night’s game, James, who scored 12 points in the fourth quarter to close out the win, acknowledged the team’s “obligation” to play out the season with pride. “It’s been a long season and it’s not gone the way we would like it, obviously. Our fans are still showing up. So it’s our obligation to go out and show them what we do in practice and in film sessions and hopefully it results in wins,” James said. James signed a four-year, $153.3 million deal to join the Lakers in the offseason. There will undoubtedly be changes ahead for the franchise, and James is promising big things.